Pungently malodorous and possessing only modest beauty, skunk cabbage offers its quirky blooms in winter when there is little else to attract the attention of devoted wildflower enthusiasts. Skunk cabbage is a coarse herbaceous plant. The stem consists of a stout rhizome oriented vertically in the soil. Leaves and flowers arise from the tip of the rhizome which is often not visible, resulting in the appearance of leaves and flowers arising directly from the swampy mires where these plants grow. Flowers appear during the winter, long before the leaves. The flowers are minute, clustered into a ball-like group (spadix) almost entirely enclosed by a fleshy, hood-like, spathe. The spathe ranges from 8 to 15 cm in height, is more or less pear-shaped, widest near the bottom, and tapers to a horizontal or curled point; spathe margins overlap except at the widest point where a small gap allows access to the flowers inside. Spathe color patterns include irregular spots, lines, and splotches, in shades of green, maroon, and purple. 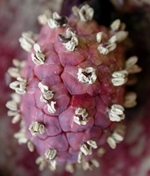 The small flowers are embedded on the surface of a globe-like spadix. 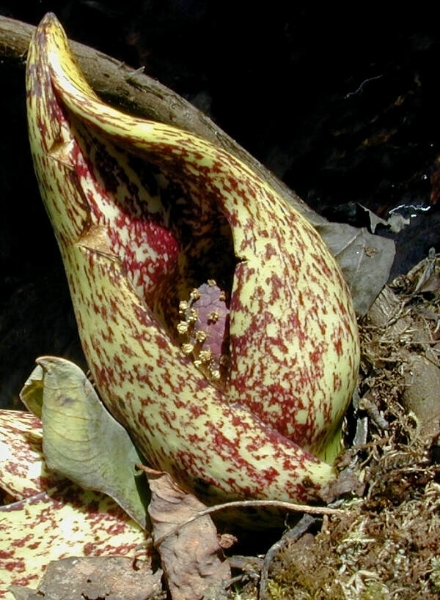 Each flower has four sepals, four stamens, and a pistil consisting of a stout, elongate, stigma visible above the ovary which is buried in the surface of the spadix. Fruits and seeds reach maturity by the end of the growing season. Leaves arise as a rosette well after the flowers; leaves have stout petioles and ovate blades with pinnate net-venation. Leaves can exceed one-half meter in length. 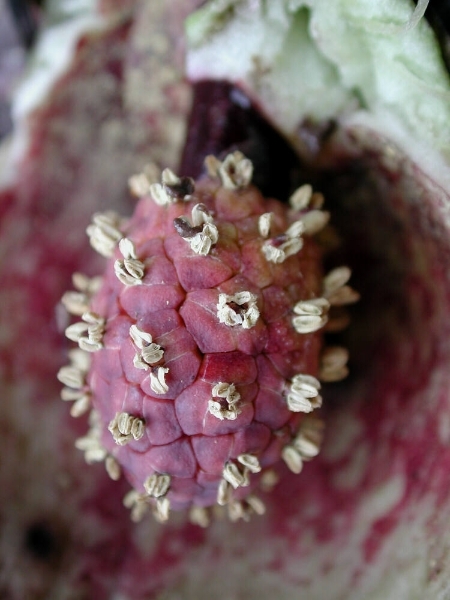 At the end of the growing season the fruiting spadix is a spongy mass about 8 to 12 cm across with numerous seeds embedded just below the surface. Each seed is about 1 cm thick. Symplocarpos translates from its Greek roots as “connected fruits,” a reference to the compound nature of the fruiting spadix; “foetidus” means foul-smelling, a particularly apt reference to the skunky odor that emanates from all portions of the plant when bruised. Skunk cabbage is a member of the arum family (Araceae) and is thus related to local wildflowers jack-in-the-pulpit (Arisaema), arrow-arum (Peltandra), and golden club (Orontium). Familiar aroids from other lands include calla lilies (Zantedeschia), peace lilies (Spathiphyllum), philodendron (Philodendron), and taro (Colocasia), the source of edible poi from Pacific Islands. Skunk cabbage leaves are, at best, marginally edible. 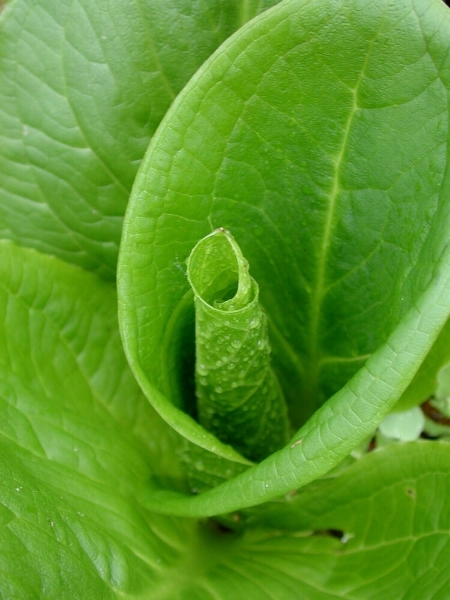 Like all members of the arum family, tissues of skunk cabbage contain crystals of calcium oxalate and, if consumed raw, these crystals can puncture mucous membranes of the oral cavity, resulting in a burning sensation that may last for hours. Cooking usually destroys such crystals, and cooked young leaves of skunk cabbage have, in the past, been consumed as spring greens. 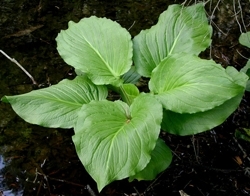 However, the deadly poisonous white hellebore (Veratrum viride) often grows intermixed with skunk cabbage, and emerging shoots of the two species have been confused with tragic results. Finally, it is an unfortunate fact of modern life that wetland habitats where skunk cabbage grows are often polluted with chemical or microbial effluents of civilization. Several medicinal uses have been recorded, but it is doubtful whether any would withstand scientific scrutiny. As always, caution is advised before ingesting any wild plant; in the case of skunk cabbage, it will be most prudent simply to enjoy them visually. Skunk cabbage is an obligate wetland plant. It grows in the muck soils of wet meadows and swampy woods, extending to regions of shallow water or upward along the lower reaches of adjacent hillsides, presumably where its roots can still reach the water table. As noted above, it flowers in winter (commonly in January), a phenomenon permitted, in part, by the fact that the plant is thermogenic (generates significant metabolic heat, a rare phenomenon in plant biology). Pollination is accomplished by insects that emerge at that season and find warm refuge within the spathes of flowering skunk cabbage. Individual plants can be very long-lived, some having been estimated to be nearly a century in age. 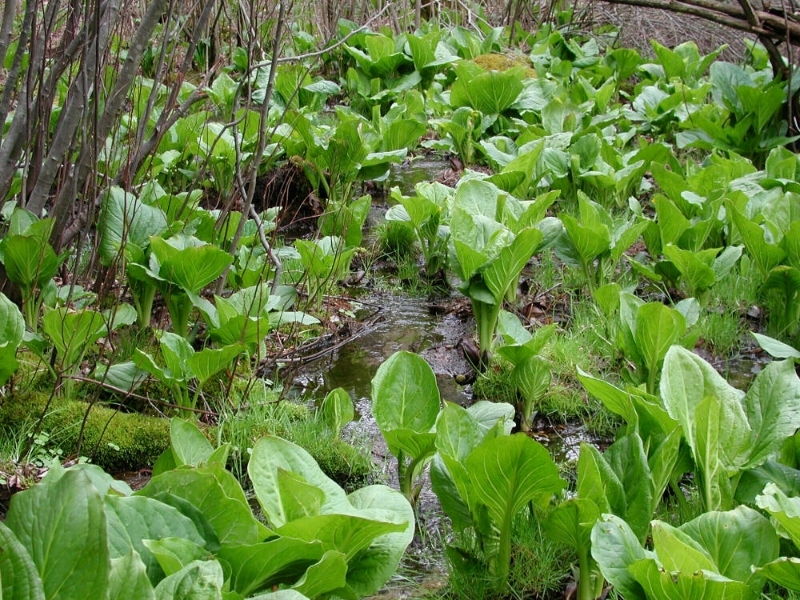 Skunk cabbage can be grown in moist garden soil, but it will thrive best when given the soggy wetland conditions to which it is naturally adapted. The spathes are sufficiently small that they are best appreciated where they can be seen close by a path or walkway. The leaves provide a bold coarse texture, reminiscent of a very large Hosta. Light shade is beneficial for retaining good leaf color throughout the season. At maturity, a single plant can easily cover an area one meter in diameter, so generous spacing is recommended. 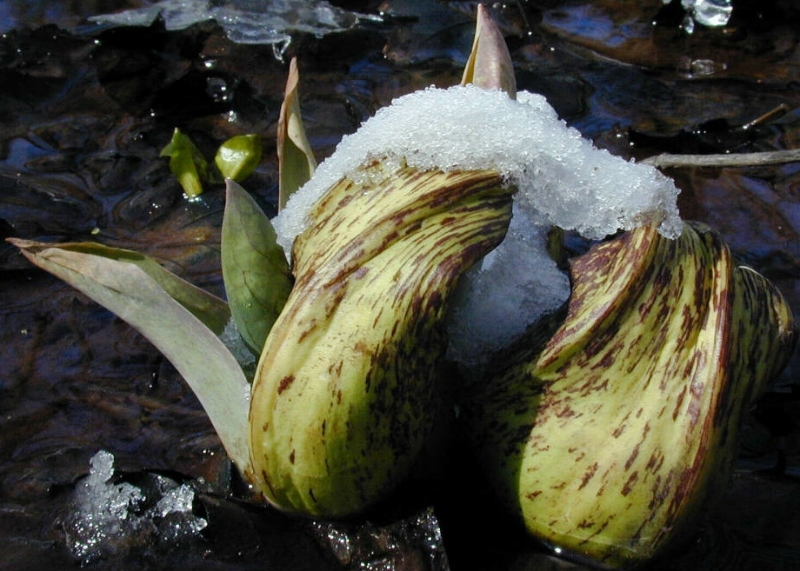 Skunk cabbage can be propagated by rhizome segments that include a few nodes each, or by seed sown outdoors in the fall. Symplocarpus foetidus occurs throughout much of the northeastern United States and adjacent Canada. Its southern limit lies in the mountains of North Carolina and Tennessee (where it is considered endangered); westward, it can be found in Iowa and Minnesota. In Virginia it has been documented in numerous counties of the coastal plain, piedmont, and mountains. It is also found in Siberia, northeastern China, and Japan. 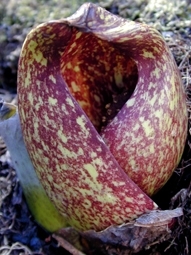 The skunk cabbage of the western United States is a related plant,Lysichiton americanus. Caution to gardeners Gardeners should not collect skunk cabbage in the wild and should be certain that all native plants purchased for home gardens are nursery-propagated, not wild-collected. For a list of retail sources of nursery-propagated plants and responsibly collected seeds, see elsewhere on this website. Text from 2009 Wildflower of the Year brochure written by W. John Hayden and adapted by him for the web. December 10, 2008. Photographs by W. John Hayden.